Prepare to be mesmerised by the beautiful – and huge – complex (which is well-maintained and always kept neat). 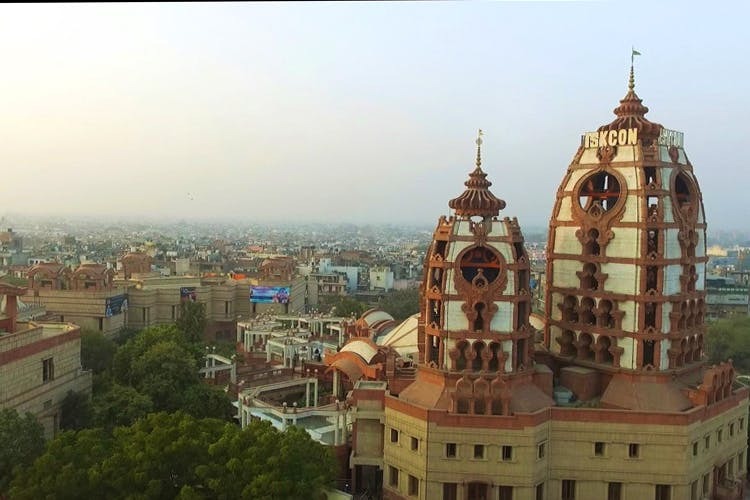 As you climb all the steps and enter the heart of the complex, the clearing on the lower floor comes into view – which depicts a huge model of Sri Krishna dancing over the kaliya naag – surrounded by ample mini-waterfalls and a pond. The place has a very calm ambiance, and you can see many families and devotees sitting and talking, or meditating on the steps leading up to the main darshan room. This museum has come up with really interesting ways of introducing the teachings of The Bhagavad Gita and illustrating important moments from the Indian epics to people of all ages. We’re talking a show with robots and light effects, an art gallery that has paintings made by devotees from all over the world, a huge video globe that plays animated videos, and more. If you’ve never attended one of their daily aartis before, you’re in for a treat. The bhajans they sing can range from very peaceful to highly energetic, and it’s a pleasant sight to see so many strangers from different corners of the world get together, sing and even dance together hand-in-hand. You can attend the darshan aarti in the mornings at 7.15am, or the sandhya aarti in the evenings at 7pm. As you step inside from Gate no.1 of the temple, you’ll find Govinda’s, their buffet-style restaurant where 18 dishes are served (all sattvik, nutritious and vegetarian). Stop by for a healthy lunch or dinner. At the same entrance, you’ll also find two stalls that sell prasadam made with love by the devotees. There are also some lovely shops, where you can buy artifacts, spiritual books, incense and clothes for clay idols. Feel free to ask any of the temple volunteers, and they will guide you to where they are. While they have elaborate arrangements for celebrating loads of festivals like Gaura Purnima and Radhastami, it is the celebrations for Ramanavami (in March or April) and Sri Krishna Janmastami (in August or September) that should be on your bucket list of events to attend. The latter includes a Shoba Yatra, which is a procession outside the temple). Also, don’t miss out on the Jagannath Rath Yatra in October/ November which includes a parade, a feast of chhappan bhoga (56 food items), as well as spiritual discourses. Here’s their website if you’d like to read more about their philosophy, schedules and volunteer activities. PS. The main temple remains closed from 1pm to 4pm, so plan your visit accordingly.